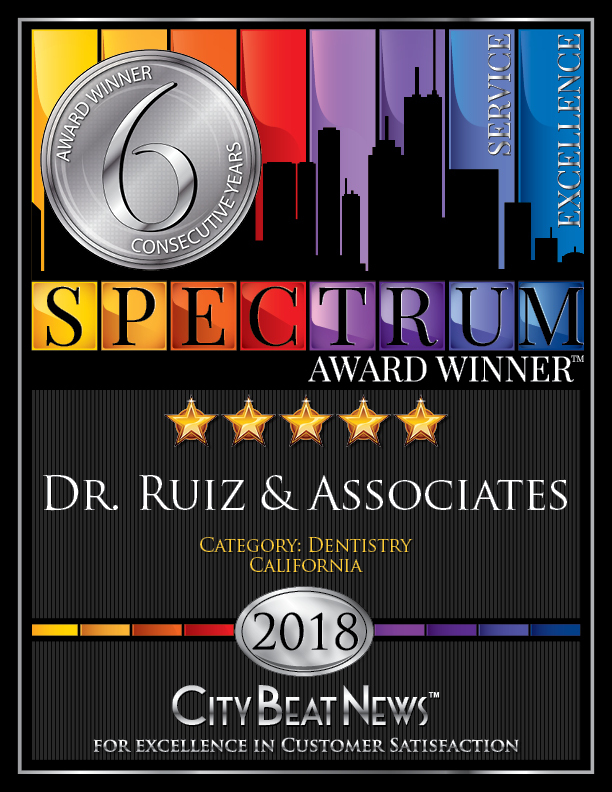 Burbank dental practice Dr. Ruiz & Associates receives its 6th consecutive City Beat News Spectrum Award for providing patients with excellent service. Burbank, Calif. (July 24, 2018): Dr. Ruiz & Associates has once again received high praise from satisfied patients and earned itself the prestigious City Beat News (CBN) Spectrum Award for Excellence in Customer Satisfaction for the 6th straight year with the highest possible rating of 5 stars. In partnership with The Stirling Center for Excellence, CBN recognizes businesses for providing an outstanding customer experience and honors them with the Spectrum Award. Winners are based on CBN’s independent, proprietary research and evaluation system, which identifies businesses with a track record of top-flight customer service and customer satisfaction. The rating system combines data collected from nominations, online and other customer reviews, surveys, blogs, social networks, business-rating services, and other honors and accolades — all of which express the voice of the customer. Only those with a 4 or 5-star rating receive the Spectrum Award. Known to many in the community as the premier dental practice in Burbank, Dr. Ruiz & Associates has an impeccable reputation due not just to quality dental services, but also its personalized attention to each and every patient. From dentists to front office staff, the entire team maintains a very high focus on patient care, treating everyone who visits like family. Dr. Ruiz & Associates is located at 1226 W. Olive Avenue in Burbank. For more information, call 818-558-4332 or go online to www.drruizassociates.com. Visit the practice’s Award Page at https://awards.citybeatnews.com/Dr-Ruiz-and-associates-Burbank-CA.